Liner notes from the album. The Quest for the Holy Grail, the emergence point of the infinite into the finite, presumes the Holy Grail is outside of us and that we must struggle through a myriad of dangers to find it. Perhaps the search has always lain within. There are many wonderful Old World children’s stories that speak of mighty quests for magical birds and stupendous treasures. After a lifetime of searching, the hero or heroine returns home, only to find the treasure or animal of immeasurable value in their own back yard. It had always been there, but the hero/heroine was not prepared in the beginning to see it. During my personal quest for the Holy Grail in May and June of 1993, I visited many ancient sites in Wales, England, Scotland, and Ireland, in search for the Sacred and the Divine. Then early one morning in Scotland, in the twilight between sleep and wakefulness, I heard repeated in my mind three times, “You are the Keeper of the Holy Grail.” Upon fully awakening, my intuition then unfolded for me the ever expanding truth that we are each Keepers of the Holy Grail. Deep within our hearts and souls we keep the Holy Grail vibration as part of our core essence. The Holy Grail, the Divine Mother essence of love, acceptance and openness to the infinite Light and Grace of the Divine Father is ever present within us all. Our spiritual awakening involves in part becoming conscious that we hold the Holy Grail essence within our beings, no matter by what name we call it, and that we can cherish our role as the Keeper. And, I believe in the final stage of our spiritual evolution, we come to know that we are the Holy Grail itself, the outpouring of the Love of Source, the union of Heaven and Earth. We come to the end of the search and discover the divine treasure has always been within us. 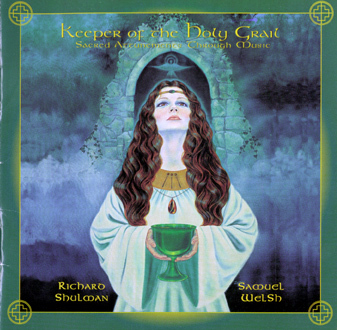 The intent of the Keeper of the Holy Grail album is to convey through music and spiritual vibrations the different energetic aspects of the Beloved so that the listener can move into feeling the Presence of Source. Source has been and shall ever be with each of us. This truth can only be realized through feeling and not through the filters of logic and thought. Each spiritual attunement embodies a frequency designed to energetically allow one to feel the love, power, and presence of Source. Richard Shulman has channeled music which harmonically expresses the spiritual energy of the attunements, allowing one on a deep level to hear and feel their essence. When the musical attunements are played in the order they are listed, each attunement is designed to create and hold the energetic space for the next one in the series. This album was created in the same manner as our previous one, Ascension Harmonics: Sacred Attunements Through Music. I directed each of the spiritual initiations into Richard’s heart chakra, and he channeled the music he felt expressed that energy. After Richard worked the raw music into a polished form, we met again in the recording studio and as the album’s music was recorded, mixed, and mastered, I channeled the spiritual energies of each attunement onto the master tape. At that point the music and the spiritual attunements were unified on the master tape. The spiritual empowerments encoded within the music on this album represent my Quest for the Beloved. I have wandered far in my life, looking for love and grace, always outside of myself. Only since1987 did I begin to realize the path led within to the very center of my being. Finally came the knowing that I had always been Home. If upon hearing and feeling this album you also discover that Home is where the heart is, then , O Keeper of the Grail, take your love out into the world which so desperately needs it…. There are so many who have forgotten the treasure they carry… and it is time for us all to laugh in joy again. “What am I creating in this moment?” Am I creating myself as a cocreator of Divine expression? Am I creating myself as a victim of forces outside of myself preventing my Divine expression? During the past year, as preparations for the recording of KEEPER OF THE HOLY GRAIL accelerated, I’ve had increasing opportunities to choose the focus of my mental and emotional energies. Discernment of energies in the world and within my consciousness, along with the discipline to act on my understanding have been tremendous tools in reformatting my consciousness from distractions, including perceived personality conflicts, anger accusation, self doubt and self created misery, into the focus and receptivity necessary to bring Divine ideas into manifestation. Sometimes in the midst of such a distraction, the most I could do was objectively watch the craziness. Most important has been my willingness to ask for and receive help from the angels, Masters my own Higher Self when I feel I’m getting off track. Also important for me was the recognition and appreciation of the help that arrived through people. I have found that when such distractions grab my attention, it is usually old patterns of thinking-feeling-behaving coming up for recognition, healing and release. By allowing the feelings to be present without squashing them or buying in to the mental pattern behind them, I begin to see more clearly. What I want first is my own inner peace, and to feel my connection of love with myself and ALL THAT IS. What I want is to participate in the Divine expression of my soul for the good of all, including myself. What I want is to be able to see and feel the Divine Plan unfolding, Love and Joy increasing, and the conscious awareness of Divinity on every level including the physical. What I want is to play my part in the mutual creation of a world that is joyful, free, and responsible, and I’m happy to start with me! This song embodies the vibration of divine love, present on the Universal Level and manifested through the heart. It is the unconditional love of Source which by its very nature expresses both compassion and forgiveness. The spiritual frequency of love infused in the song can activate the love vibration within the listener through resonance. If you can feel Divine Love within yourself as you listen, it is because that Love is already present witin your being. Nothing has been given to you that you don’t already have. All the spritual attunements in the Keeper of the Holy Grail are designed to activate your Divine qualities through resonance. If as you experience the musical attunements you heel lovable and loving, magnificent and expanded, sacred and holy, then know it is only your own True Nature that you are experienceing. Existing within the heart of all of us is a place of Divine purity untouched by the vicissitudes of life. Within this purity reside qualities of peace, unconditional love, inner joy, and a feeling of coming home. From the recognition of being home, a love-reality opens, expressing as our fondest dreams coming true. Our spine is the energetic core of our physical being through which the cosmic and earth energies flow. To be truly filled with spiritual Light means we have opened this sacred core and allowed the Light to freely flow. This song’s spiritual attunement activates and opens the energy centers up and down the spine. As a result, a tremendous infusion of spiritual Light into the physical body occurs. For those acquainted with the chakras, this attunement opens the 7 majoy chakras as well as the chakras above and below the body. The “Sacre Couer” is the central focus of our vertical alignment between the Great Central Sun and the core of the Earth, the bridge or Sacred Corr-idor between Heaven above and Heaven below. The music expresses the expansion of the vertical core and the radiation of inner joy which flows forth from this expansion. The Holy Grail was a mystical symbol for the Divine Feminine aspect of our Being. One description of the Holy Trinity is that of the Divine Father, the Divine Mother, and Divine Child. And, it is the Divine Mother’s vibrational aspect that is embdied in the song of the Holy Grail. I experience the Divine Feminine as soft and allowing, enveloping and holding the space for the manifestation of our divine consciousness in physical form. It is the Divine Feminine that accepts, allows, and receives the presence of the Divine Masculine. The Holy Mothers were asked to be present during the recording of the song and to infuse the Divine Feminine essence into the music. To me the Holy Grail is the purified human personality in total alignment with the Divine. Here is a humility of recognition and surrender to the Divine along with a dignity of knowing that one is Divine in essence and birthright now and all-ways. Humility and dignity heal the illusions of arrogance and unworthiness, and there is a divine quality that can heal every illusion. Through life experience, our quest, we can learn to weave these qualities into a chalice of energetic mastery. This is the HOLY GRAIL, which is able to receive and hold the nector of Divine Grace within our being. This music reflects the love of the bride of Spirit which is our true receptive nature. An inadvertant quote in the music gave me confirmation of the holiness of this piece. The Divine Child aspect of the Holy Trinity was invited in and asked to assist in the encodement of the Christos frequency into the song. The Christos frequency of Love is universal and available to all of us when we tune into it. The Divine Child Christos aspect represents the holy union of the Divine Father and Divine Mother. It was profoundly manifested through Jesus, who helped set the template for the embodiment of the Christos frequesncy in the flesh. Personally for me, the Divne Child essece carries the qualities of joy, innocence, playfulness, strength, centerdness and above all else, love without judgement. The Divine Father aspect of the Holy Trinity was asked to be present during the final recording and to infuse the Divine Masculine energy into the song. For me, the Divine Father’s energy represents “love in dynamic action.” It is very powerful, unquestionably vital and carries the qualities of wisdom, courage, will and grace. The Divine Father embodies the strength and support you can draw upon when you feel in the state of need. For those sensitive to energy, notice near the end of the song that the Divine Mother (Holy Grail) essence once again appears to be joined by that of the Divine Child Christos. Then the Divine Father essence returns to unify with the Divine Mother and Divine Child; for a brief moment, the essence of the Holy Trinity is present. This energy reminds me of Moses, Elijah and the great patriarchal prophets, and musically it turned out to be great fun, a fantasia of creation with no end. The Divine Plan for the Earth, held by the Christos and Forces of Light, is dynamic and yet embodies those qualities recognized as the foundation of the Golden Age: forgiveness, compassion, unity, love and freedom. In the same sense that a plan for a port of arrival allows one to steer a ship to its final destination, the Divine plan for the Earth provides a spiritual map for souls on earth, a goal towards which we can orient ourselves to manifest the highest outcome for the planet and ourselves. During this song’s recording, the energy space was held for the encodement of the Divine Plan for Earth along with the music. The Christos and spiritual forces overseeing the Divine Plan were asked to assist in the encodement of the Hologram energetically onto the music track. As I was encoding the Hologram, I heard “We are the Divine Plan,” and I was clearly shown we are its unfoldment. “Life can be fun!” and the Divine Plan is infinitely malleable as we co-create Heaven on Earth with Spirit. Every drama is an opportunity for a healing or a blessing. You may hear a little Beethoven and a little Mozart in this piece before it returns to the theme of the Sacred Heart, which holds the love through which the wisdom and power of the Divine Plan can manifest. I experience the Holy Spirit as the formless flow of Source from which all physical matter is created. It is soft, malleable and yiedling, and like liquid love, can be poured into any form. The Holy Spirit is always with us and coursing through us, although we are usually unaware of its presence. The spiritual attunement encoded in this song helps to open the energy centers of the body (the chakras) and increase the flow of the Holy Spirit through our Being. When the flow of the Holy Spirit becomes strong enough, its presence becomes palpable and undeniable. Another important aspect of this attunement is the act of surrender, of letting go and letting God handle the details. One night as I was working on completing the orchestration for this piece, I found myself deeply inspired by the sweetness of the music. In this open state I became aware of a blissfull energy spiralling into my body from above my head. I held my body, mind and emotions as still as possible to receive this blessing fully. The gratitude I have for this Holy Presence in my life is tremendous. May the Presence of the Holy Spirit ever increase in your awareness and life. When the spiritual energies described for the previous seven songs are experienced together as one, the result is grace. I know of nothing sweeter than the feeling of grace. It involves for me the full experience of my Divinity, the sensing of my oneness with Source, the knowing that I am loved and supported. Grace is the sacred and sweet essence held in the Holy Grail, and always and continuously available to us, once we fully realize we are the Grail’s Keeper. For the recording of this song, the Masters and Guides that hold the field of grace were invited in, as was Prime Creator and the Beloved. Then, the essence and quality of infinite grace was asked to be imbued into the music. In preparation for each of my composing sessions for this project, I worked with my Higher Self to clear and raise my vibration so as to bring through the most beautiful and sacred music possible. There were many times that it seemed as if I would never break through to a higher consciousness. At those times, I was able to give myself one consolation: that the Infinite Grace of God is greater than any problem or illusion I seem to be stuck in. By calling forth and being willing to receive Infinite Grace I was able to refocus my attention and move forward with the session. I invite you to demonstrate Infinite Grace in your own life as well. As a composer, I love to take people Home. It is my sincere desire (and Samuel’s also) that you experience through the music and spiritual attunements of KEEPER OF THE HOLY GRAIL the remembrance of your Divinity and Oneness with all of Life. May we all come to know ourselves as Divine within and beyond form. And may we, created as cocreators in the image and likeness of God, through the Infinite Grace of the Divine learn to create Heaven on Earth for the Highest Good of ALL. 1. Relax in a comfortable chair. 2. Bring your focus to your heart and visualize there, a doorway to your Divine Self. 3. Imagine yourself passing through that heart doorway and merging with your Divine Self. When you feel united, move onto the next step. 5. Begin playing Keeper of the Holy Grail. We recommend you listen to the musical empowerments in the order recorded and to listen to the entire empoerment series at one time to receive maximum effect. 6. After you have listened to Keeper of the Holy Grail, once again focus on your heart doorway and feel yourself merge with your Divine Self. Composer, Arranger and keyboard musician (piano & synthesizers). Co-creator and encoder of the spiritual attunements. Special thanks to the SOURCE of ALL THAT IS for musical inspiration, spiritual attunements, and the support to bring KEEPER OF THE HOLY GRAIL to the world, to the innumerable Masters, Angels and beings of Light and Love who assisted us, and to: William G. Ligon, Richard Heap, and Erik Offner for moral and financial support • Dave Moore for astute financial advice and assistance • Mary McChrist for helping us infuse the Holy Mother essence into the song of the Grail • Pat Nelson for the creation of the stargate • Joseph Cutrufello for the star energies encoded in “Infinite Grace” • Lauren Gdovin for moral support and running the business while Richard and Samuel were lost in the time-warp of recording • Dorje Funk for surprise catering • Michael Bitterman for his laughter, coffee, and studio • Robert Frazza for his excellent work in recording the orchestral music • Scott Petito for his superb recording, mixing and mastering and for his “Infinite Patience” • all the musicians, who gave 100% to the project • and to Norma Milanovich, for holding the vision and for providing support on many levels. Please Note: Do not drive or operate heavy machinery while listening to this music.